An inventive way to help murrelets! 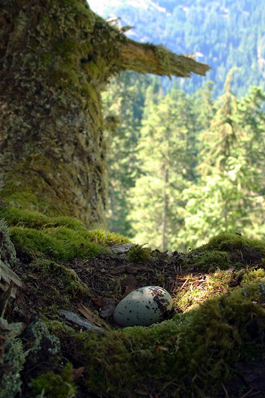 Because the Marbled Murrelet lays only one egg, its odds of raising a family are slim. 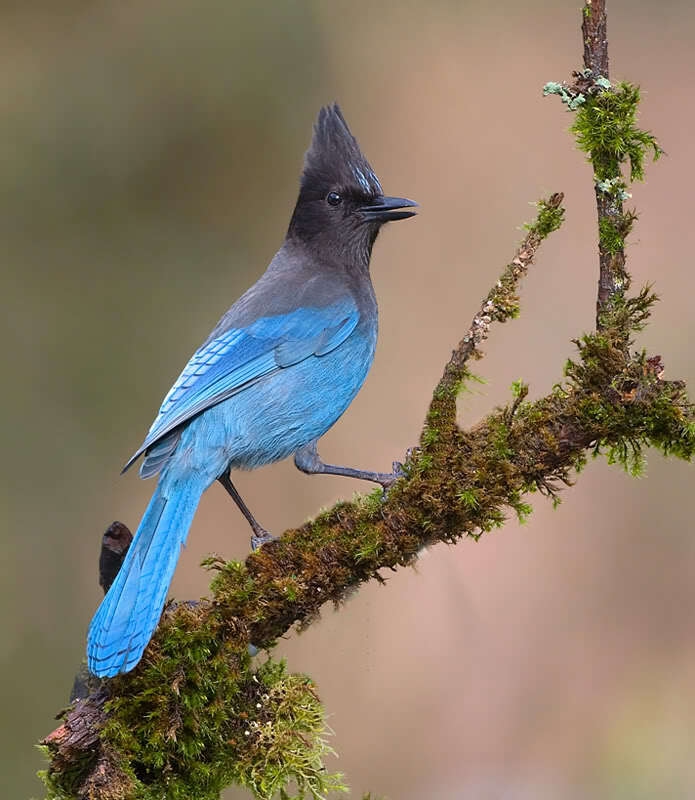 Steller's Jays – as they frequent campgrounds in the redwood forests of northern California, looking for human handouts – further threaten murrelet reproduction by eating their eggs. Fortunately, scientists have turned the jay's extraordinary learning capacity into a way to help those beleaguered murrelets. Here, the jay studies an untreated control egg. The blue egg in the background is a fake murrelet egg, treated with carbachol. This picture was taken by a motion-sensor-triggered trail camera. The Marbled Murrelet is a bird of the deep forest and of the ocean. Because it lays one and only one egg, its odds of raising a family are slim. And with the forest being thinned and the ocean warming, the murrelet's job is getting tougher and tougher. 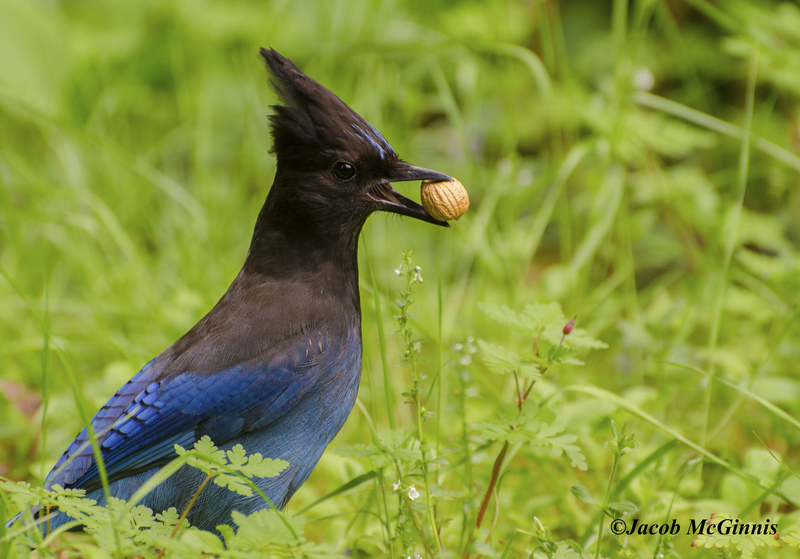 Then, in marches the Steller's Jay, to complicate things even more. 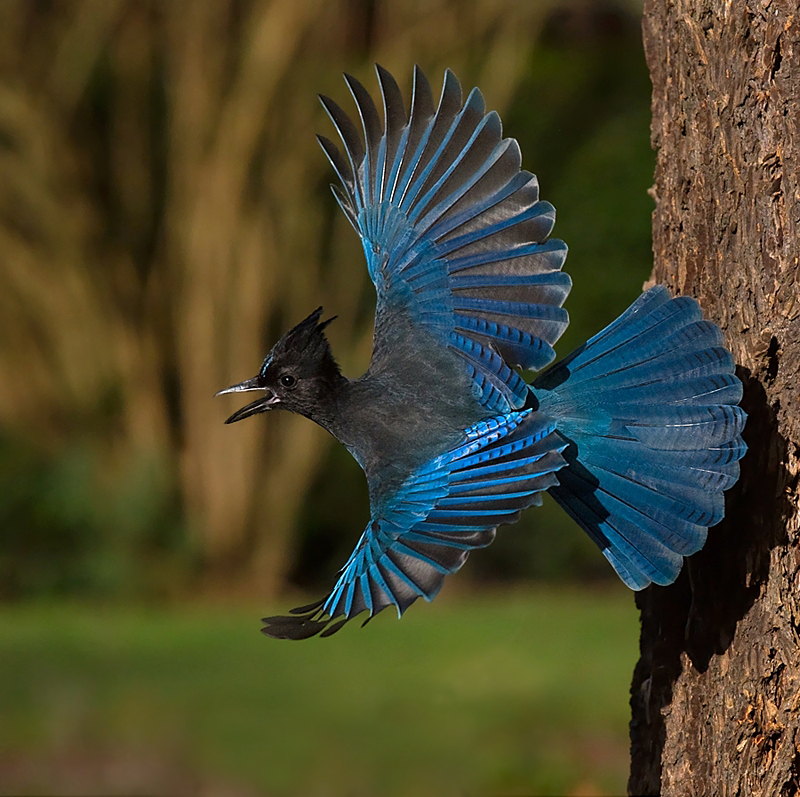 Steller's Jays love to hang out around campgrounds in the redwood forests of northern California, looking for human handouts. And while a jay cruises the area, it just happens to find that solitary Marbled Murrelet egg in a nearby tree. One more tasty morsel. And one less murrelet. Well, scientists have turned the jay's extraordinary capacity to learn into a way to help those beleaguered murrelets. Researchers painted small chicken eggs to look like murrelets' eggs, and stashed them in plain sight around several campgrounds. But those wily scientists added a secret chemical ingredient: carbachol. Carbachol makes the jays vomit. And fast, too – within five minutes after eating the egg, so the jay could link the foul experience with the egg it just ate. And the jays get the message, leaving the eggs alone after that. Amazing! There's a lot more to this story at BirdNote.org. I'm Michael Stein. Bird sounds provided by The Macaulay Library of Natural Sounds at the Cornell Lab of Ornithology, Ithaca, New York. Call of Marbled Murrelet  recorded by T.G. Sander; call of Steller’s Jay  by W.W. H. Gunn. Ambient from Coniferous Forest Ambience #63 recorded by Gordon Hempton of QuietPlanet.com. 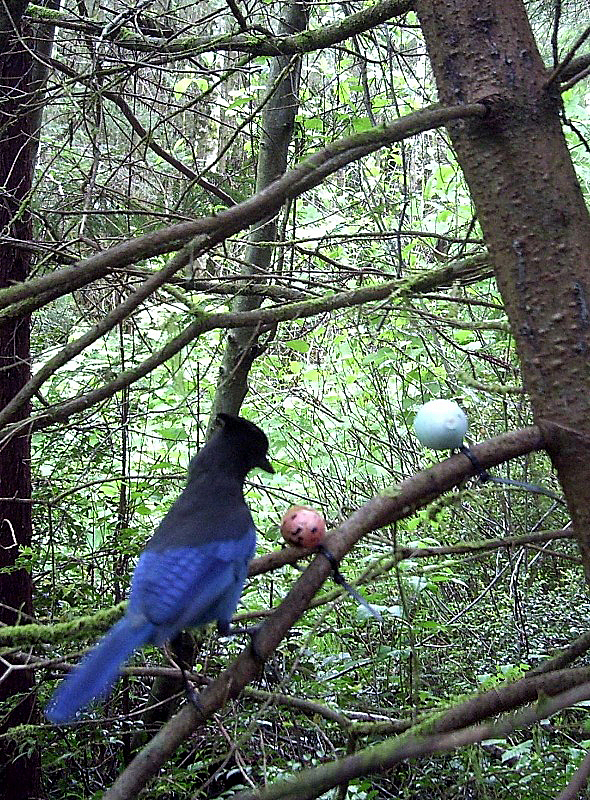 See photos from the researchers - creating the eggs & fooling the jays!